It's been a rough year in solar energy, but this new product could drive SolarCity Corp's future. 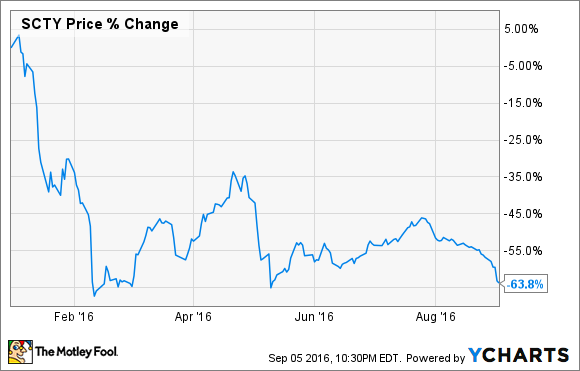 No matter how you slice it, 2016 has been rough for SolarCity Corp (NASDAQ:SCTY.DL). The company has had to lower installation guidance multiple times, the cost to sell solar-power systems is rising, and now financing costs are going up as well. Amid it all, SolarCity has brought a transformative product to market that could drive the company's results for years to come, but it hasn't gotten much attention because of Tesla Motors' drive to buy the company and the falling stock price. Here is SolarCity's best product of the year and why it could transform the company. Solar leases, or power purchase agreements (PPA), have been the dominant financing method for rooftop solar sales for many years. It allows customers to put solar on their roofs for no money down and still gives them savings on their energy bill. All they have to do is sign a 20 year agreement to buy energy from a company like SolarCity. But flaws are starting to emerge in the leasing/PPA model. SolarCity's financing costs are going up and customers are starting to question whether it may save them more money to just buy a solar-power system. That's led to growing market share for cash sales and solar loans over the past year. SolarCity saw this change coming a few years ago, but its first loan product, named MyPower, was a huge failure, largely because it was complex and had a bill based on energy production. In many ways it was a lease/PPA in disguise. Earlier this year, SolarCity fixed that major gap in its offering and started selling solar loans to customers. Loans are as short as 10 years with a 2.99% interest rate or as long as 20 years with a 4.99% interest rate. And it could change the company's future. In a lot of ways, loans are much better for solar installers and customers. The solar installer gets cash upfront and doesn't have to take on the financing risk a lease or PPA comes with. In SolarCity's case, it gets all of the revenue from building the solar-power system upfront, which could help it become cash flow positive far more quickly than the lease/PPA model. For the customer, he or she can take advantage of tax benefits and the solar-power system becomes an asset when he or she sells their home. A lease/PPA is by definition a liability he or she hopes a new homeowner will take on. The downside is that it's much easier to compare the cost of solar-power systems being bought with cash or a loan. SolarCity doesn't have a product differentiation from competitors and uses many of the same components a local installer may use. So, now it's competing on cost. SolarCity needs to show that it can generate cash and become profitable, which is why loans will be key for the company, particularly if the Tesla Motors deal falls through. More upfront cash may come with lower margins, but that's better than seeing financing costs soar, strangling the business. A few years from now, SolarCity may be a solar loan company, which would be a huge strategic shift from where it is today. And that would be good news for investors long-term.